This memorial website was created in memory of our loved one, Iwan (John) Demjanjuk, 91, born on April 3, 1920 and passed away on March 17, 2012. Where Iwan (John) Demjanjuk is buried? Locate the grave of Iwan (John) Demjanjuk. How Iwan (John) Demjanjuk died? 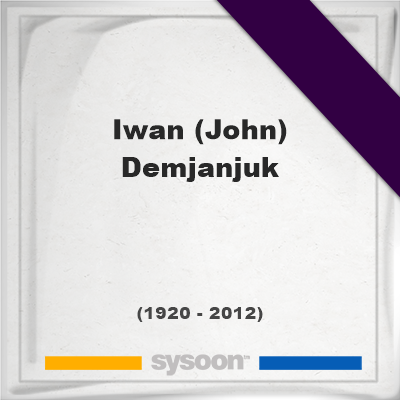 How to find family and friends of Iwan (John) Demjanjuk? What can I do for Iwan (John) Demjanjuk? Demjanjuk was a man who was convicted as a war criminal. He was a guard at Sobibor camp in Nazi-occupied Poland in 1943. He denied this, saying he was a prisoner of war and a victim too. An estimated 250,000 people died in the gas chambers at Sobibor. Demjanjuk was convicted of being an accessory to the murder of the 28,060 people who were killed there while he was a guard. Prosecutors had argued he was recruited by the Germans to be an SS camp guard and that by working at a death camp he was a participant in the killings. No evidence was produced that he committed a specific crime. It was the first time such a legal argument had been made in a German court. Central to the prosecution's case was an SS identity card indicating Demjanjuk had been posted to Sobibor. The defence cast doubts on the authenticity of the card but court experts said it appeared genuine. He was convicted to five years in prison. Demjanjuk was later released pending appeal, and lived at a German nursing home in Bad Feilnbach, where he died. Note: Do you have a family photo of Iwan (John) Demjanjuk? Consider uploading your photo of Iwan (John) Demjanjuk so that your pictures are included in Iwan (John) Demjanjuk's genealogy, family trees & family history records. Sysoon enables anyone to create a free online tribute for a much loved relative or friend who has passed away. Address and location of Iwan (John) Demjanjuk which have been published. Click on the address to view a map. Iwan (John) Demjanjuk was born in Dubovi Makharintsi, Ukraine. Iwan (John) Demjanjuk died in Bad Feilnbach, Germany.